Easter is an exciting celebration of new life, and we’d love nothing more than to celebrate this occasion with you! We have an awesome fun and engaging Kidz Ministry. Our dress and services are casual, energetic and meaningful. You’ll find music that uplifts you, a message that is real and relevant and people from all walks of life who will be there to experience Jesus Christ ALIVE with you! Whether you grew up in church, haven’t been in years, or have never been, you’re welcome at The WORD Church! We are looking forward to meeting you and your family this Easter, April 21st at the M.O. 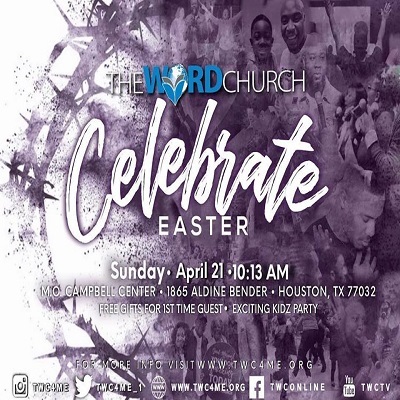 Campbell Center (1865 Aldine Bender | Houston, TX 77032) for one electrifying service at 10:13A! After service join us under the port for refreshments, prayer tent, music and meet and greet people just like you. You don’t want to miss it!